Cap and trade systems are considered to be one of the most cost-efficient options to achieve emission reduction targets. This paper extends the literature on the evaluation of emissions trading systems (ETS) by providing insights into the methodology of the ex-post evaluation of cost-efficiency. Based on data from the second trading period of the EU ETS, this paper compares different settings for ex-post cost-efficiency analyses. A highly disaggregated base scenario reveals average cost savings from trade of about 865 million Euro p.a., an efficiency gain of 47% compared to the alternative policy scenario without trade. Sensitivity scenarios indicate lower efficiency gains in cases with higher sectoral and regional aggregation emphasising the importance of intra-industry and inter-country trade. Furthermore, assumptions regarding the abatement requirements under the alternative policy play a key role, along with the choice of marginal abatement cost curves. In line with ex-ante results from the literature, the backward looking empirical results of this paper uniformly support the theoretical cost-efficiency of the EU ETS. 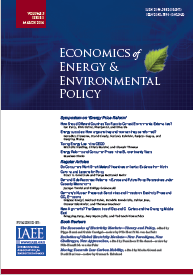 Published in Volume 8, Number 1 of The Quarterly Journal of the IAEE's Energy Economics Education Foundation.